In this ordering game, pupuils need to put the statements into the correct order by dragging them up or down. They can check if they are correct at the end by using the mark button at the bottom. This match up game has two parts to it. The first page asks pupils to match up parts of a corrie with the labels. 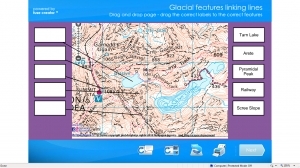 Once complete, clicking next takes you into the second part of the game, which asks pupils to label glacial features using the labels. The.. This match up game has two parts to it. 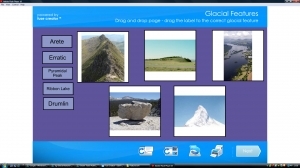 The first page asks pupils to match up photographs of glacial features with the correct labels. Once complete, clicking next takes you into the second part of the game, which asks pupils to sort the correct.. 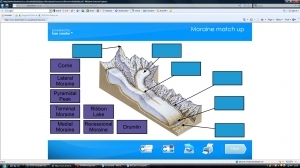 In this match up game, pupils need to label the moraines and other glacial features correctly. There is a mark and reset button at the bottom to improve the activity further. 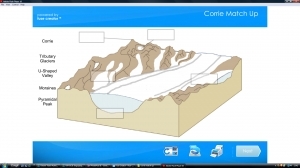 This activity gets pupils thinking about the identification of glacial features on OS maps. There are some other features there as well, and there are mark and feedback buttons on the bottom to aid the activity. This task gives pupils a key word from the topic that is jumbled up. Pupils have 30 seconds to enter the correct answer, against the countdown timer. This penalty shootout is designed specifically for KS4 pupils. Pupils simply answer a question and then take their penalty. It has the option for 1 or 2 players and works well with the class split into two teams. A taboo style game where 1 pupil has to have his or her back to the board. Pupils then take turns describing key words to this person, without using a set of banned key words.